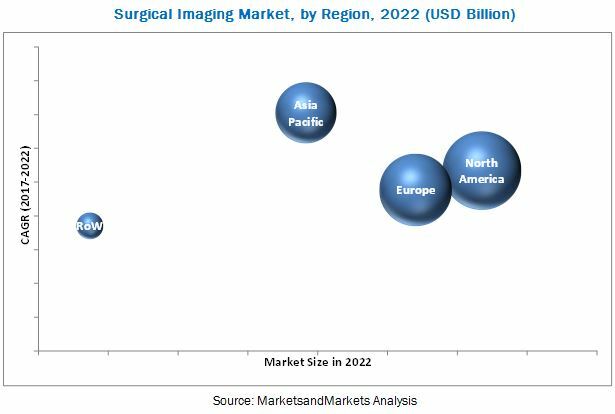 [131 Pages Report] The overall surgical imaging market is expected to grow from USD 1.25 billion by 2017 to USD 1.63 billion in 2022, at a CAGR of 5.5% from 2017 to 2022. The key factors driving the growth of this market are growing popularity of Flat Panel Detector C-arms (FPD C-arms) owing to advantages of FPDs over image intensifiers, reimbursement cuts on analog radiography systems, and increasing demand for minimally invasive procedures. The growing demand for data integrated imaging systems and high growth in emerging markets like Asia Pacific is an opportunity for the market to grow. The base year considered for the study is 2016, and the forecast has been provided for the period between 2017 and 2022. The evolution of C-arms—from the traditional X-ray image intensifier technology to digital flat-panel detectors (FPDs)—has brought about significant advancements in diagnostic imaging. FPDs have a number of advantages over image intensifiers, such as compact size and reduced radiation dose. Although resolution varies from model to model, FPDs have the ability to produce a more consistent high-quality digital image. Due to such advantages, the preference for FPD C-arms among hospitals is increasing, thereby driving market growth in this segment. 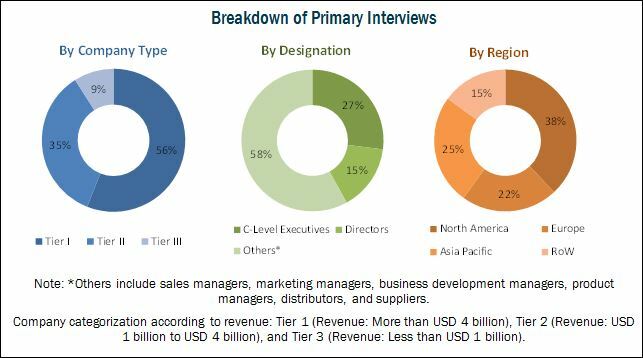 During this research study, major players operating in the surgical imaging market in various regions have been identified, and their offerings, regional presence, and distribution channels have been analyzed through in-depth discussions. Top-down and bottom-up approaches have been used to determine the overall market size. Sizes of the other individual markets have been estimated using the percentage splits obtained through secondary sources such as Hoovers, Bloomberg BusinessWeek, and Factiva, along with primary respondents. The entire procedure includes the study of the annual and financial reports of the top market players and extensive interviews with industry experts such as CEOs, VPs, directors, and marketing executives for key insights (both qualitative and quantitative) pertaining to the market. The figure below shows the breakdown of the primaries on the basis of the company type, designation, and region considered during the research study. Key players considered in the analysis of the surgical imaging market are GE Healthcare (US), Koninklijke Philips N.V. (Netherlands), Siemens AG (Germany), Ziehm Imaging GmbH (Germany), Hologic, Inc. (US), Shimadzu Corporation (Japan), OrthoScan, Inc. (US), Medtronic plc (US), Toshiba Medical Systems Corporation (Japan), GENORAY Co., Ltd. (South Korea), Eurocolumbus s.r.l. (Italy), and Allengers Medical Systems Ltd. (India). In 2016, Shimadzu Corporation established an indirectly-owned subsidiary—Shimadzu Malaysia Sdn Bhd. What are new technology trends which the surgical imaging companies are exploring? The overall surgical imaging market is expected to grow from USD 1.25 billion in 2017 to USD 1.63 billion in 2022, at a CAGR of 5.5% from 2017 to 2022. The advantages of FPDs over image intensifiers, reimbursement cuts for analog radiography systems, increasing demand for minimally invasive procedures, rising geriatric population, and growing chronic disease prevalence are the key factors propelling the growth of this market. The surgical imaging market includes mobile C-arms which are imaging scanner intensifiers. C-arms are primarily used for fluoroscopic intraoperative imaging during surgical, orthopedic, and emergency care procedures. This device offers high-resolution X-ray images in real time, thus allowing physicians to monitor progress and immediately make any corrections. On the basis of technology, the surgical imaging market is segmented into image intensifier C-arms and Flat Panel Detector (FPD C-arms). The FPD C-arms segment is expected to register the highest CAGR during the forecast period. FPDs are increasingly replacing image intensifiers on mobile C-arm systems, owing to advantages offered by the FPD technology such as increased image quality (no deterioration of the image quality over time) and lower patient dose. The surgical imaging market in APAC is expected to grow at the highest CAGR during the forecast period owing to the rapid growth in geriatric population in Japan, healthcare reforms in China, improving healthcare infrastructure in India, and rising number of orthopedic and CVD procedures in Australia. The number of orthopedic surgeries is expected to grow in the coming years due to an aging demographic and rise in obesity rates, globally. Obesity is a major risk factor for disorders of the joints and other orthopedic conditions. With the growth in the number of orthopedic surgeries, the demand for advanced surgical imaging tools such as C-arms is expected to increase across the globe during the forecast period. Surgical imaging has major applications in the brain and spinal surgeries. Neurosurgeons widely use imaging during these surgeries as they require small objects—biopsy needles, implants, or tubes—to deliver drugs to precise locations in the brain. Moreover, advanced imaging and navigation capabilities enable integrated interventions and thus play a key role in neurosurgery. Neurosurgery comprises a variety of procedures with very specific imaging requirements. For instance, spine surgery includes vertebrae fusion, kyphoplasty, and vertebroplasty. C-arms with high resolution and penetration are, therefore, essential to monitor the correct positioning of screws, instruments, implants, and injected cement. Furthermore, 3D imaging with navigation enhances treatment precision and enables intraoperative evaluation of surgical procedures. The use of C-arms for neurosurgery, especially spinal surgeries, is expected to increase in the coming years with technological advances that have enhanced the diagnosis and treatment of spinal issues. In the US, the Healthcare Cost and Utilization Project Nationwide Inpatient Sample shows a net increase of 5% in vascular surgery procedures (490 to 515 procedures per 100,000 capita) in the per capita rate for all adults. This project has estimated that the workload of inpatient vascular surgeries will increase by 34% by 2020, and 72% by 2030. 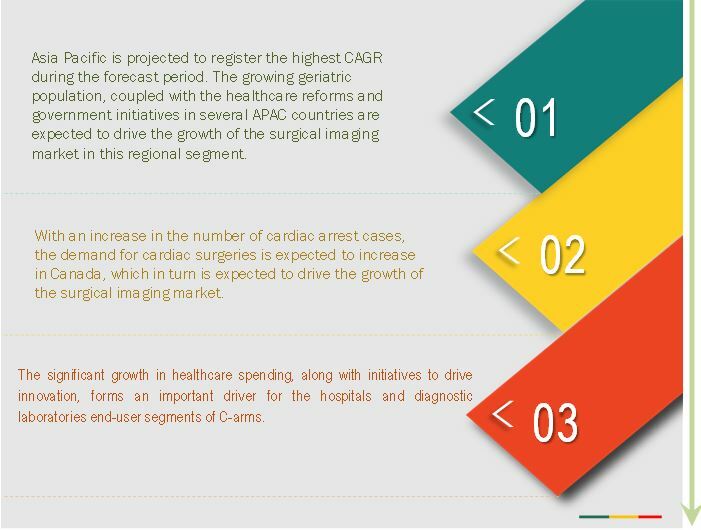 The increasing prevalence of cardiovascular diseases in developed as well as developing countries, coupled with the growing use of advanced imaging equipment in cardiovascular surgeries, is expected to support the growth of this market segment during the forecast period. With changing lifestyles, the prevalence of GI disorders is increasing globally, which, in turn, is expected to drive the demand for C-arms. According to the International Foundation for Functional Gastrointestinal Disorders, irritable bowel syndrome (IBS) is the most common functional GI disorder with worldwide prevalence rates ranging from 9% to 23%. The C-arm Image Intensifier offered from Allengers is an example of a novel surgical equipment that assists gastroenterologists in treating disorders more accurately. Other applications of C-arms include urological, endobronchial & thoracic, and maxillofacial surgeries. There are two main areas in urology where 3D interventional imaging can challenge current treatment methods. One is in endourology (for the removal of kidney stones) and the second is in MIS (for the treatment of renal cell carcinoma). C-arms are also used in maxillofacial surgeries. The human skull comprises complex anatomical structures and performing any surgical procedure in this area requires high technical standards. Intraoperative 2D and 3D imaging play a crucial role in the surgery for zygomatic bone fractures and removal of foreign bodies. C-arms are revolutionizing surgeries not only limited to orthopedic and neurology but are also opening up new avenues in areas such as urology, endobronchial, thoracic, and maxillofacial surgeries. What are the upcoming industry applications for surgical imaging? The high cost of instruments is a major factor restraining the growth of the market. Owing to their advanced features and functionalities, mobile C-arms are generally quite expensive and cost above USD 200,000. Advanced mobile C-arms are equipped with powerful generators (up to 20kW) which enable the penetration of dense anatomies. GE Healthcare’s OEC 9900 Elite and Ziehm Imaging’s Vision RFD are among the most expensive mobile C-arms manufactured. The large image displays in these mobile C-arms enable a precise evaluation of the images while allowing the surgeon to view and analyze these images at a distance. In addition to the huge purchases cost, these equipment have several other direct expenses for printers and DICOM boxes, which results in an overall increase in the total cost of ownership. Due to the requirement of significant capital expenditure, many small and medium-sized institutions find it hard to purchase these equipment. Key players in the market include GE Healthcare (US), Koninklijke Philips N.V. (Netherlands), Siemens AG (Germany), Ziehm Imaging GmbH (Germany), Hologic, Inc. (US), Shimadzu Corporation (Japan), OrthoScan, Inc. (US), Medtronic plc (US), Toshiba Medical Systems Corporation (Japan), GENORAY Co., Ltd. (South Korea), Eurocolumbus s.r.l. (Italy), and Allengers Medical Systems Ltd. (India). These players are increasingly undertaking partnerships, agreements, alliances, collaborations, product launches, expansions, and acquisitions to develop and introduce new technologies and products in the market. *Details on Overview, Strength of Product Portfolio, Business Strategy Excellence, Products Offering, and Recent Developments Might Not Be Captured in Case of Unlisted Companies.